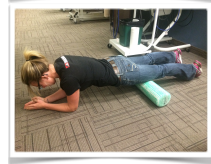 Foam Roller Exercises are useful tool for improving flexibility, balance, strength and muscular awareness. For starters, the rolling motion allows for release of muscle tightness in muscles that are difficult to reach with ordinary stretches. The elevation of the foam roller allows for increased extension in the shoulder and chest area allowing for a better stretch. In addition, the unstable cylindrical shape of the roller provides a challenging environment for abdominal strengthen exercises. For proper use, avoid rolling on tendons, joints and bony structures. For each rolling exercise hold the position on the roller where the tension is felt until the tight muscle releases or for 1 minute, whichever occurs first. Sit on one end of the roller and then lay back. Your head should be resting on the roller and your knees should be bent with your feet flat on the floor, shoulder width apart to provide balance. Bring both arms up in front of you and bend both elbows to 90 degrees, forearms will be parallel to the ground. Keeping your elbows bent, open your arms out to the sides and relax. Let gravity stretch the muscles of your chest and shoulders. Sit on one end of the roller and lay back so that your head is supported on the roller, and your spine is in line with the roller. Bend knees to provide balance. Bring your arms straight up so that they are pointing towards the ceiling. Drop your arms over your head and allow gravity to cause stretch. This will stretch your latissimus dorsi muscles and help to extend your thoracic spine. Lay on the roller so that your spine is perpendicular with the roller and roller is across your mid back, bend knees and lift hips off the ground while maintaining a flat body position. Place your hands behind your head to support your neck. Roll back and forth from the top of the shoulders (not on the neck) down to the bottom of the rib cage. 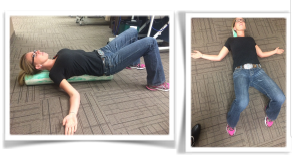 This exercise will help improve the mobility of the thoracic spine encouraging movement in each segment. Sit on the roller with your legs slightly extended in front of you and your body leaning back. 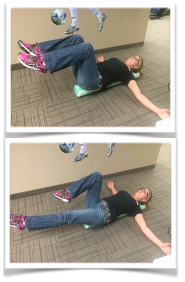 Placing your weight on either your left glute or your right glute, roll across the gluteal muscles. Take longer through the tighter areas. 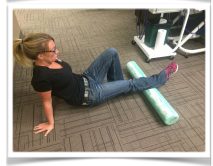 Lay on the roller so that the roll sits under the side of the leg just below the hip joint. Support the weight of your body on your hands, and opposite leg (which is crossed out in front of the leg on the roll). Roll back and forth from below the hip until just above the knee. This exercise helps loosen up your Ilio-Tibial Band (ITB) which runs down the outside of your leg from your hip to your knee. Note: If your ITB is tight, this may be uncomfortable to perform. As your ITB becomes looser the exercise will become less uncomfortable. To increase pressure at this point, extend your supporting leg. Lay on your side so that the roller is placed just above the hip joint (not on the hip joint). The tensor fasciae latae (TFL is a muscle that runs from he hip to the top of the pelvis. You will not have to roll much with this exercise, as it is a small muscle. If you set the roller just above the bony part of the hip and below the pelvis, you should be in the location of the TFL. Lay face down on your elbows with the roller under your quadriceps (the front of your upper leg). Support your weight with your hands on the floor and one calf on the roller, with the other leg in front of the roller with your foot on the floor Do not sit on the floor. Using your upper body roll from your heel to the top of the calf. Sit on one end of the roller and lay back so that your head is supported on the roller. Reach your arms out to each side like a “T”. Have your knees shoulder width apart and bent approximately 90 degrees with your feet flat on the ground. Begin by tightening your stomach muscles trying to pull your belly button to the back of your spine without tucking your tailbone under. Maintaining the neutral position of the spine, slowly lift one knee up till your thigh is perpendicular to the ground then lower the leg back to the starting position. Alternate legs until fatigued. Lay in the same body position as above, maintaining the neutral spine position. Begin with both knees bent and legs up so that your thighs are at 90 degrees to your body. Slowly lower one leg towards the floor. Without touching the floor, lift the leg back to the starting position and alternate legs. Maintain the neutral spine position through out the entire exercise. In order to increase difficulty, move your hands from the straight out “T” position to down by your sides. For even more difficulty, reach your arms directly over head beside your ears. Due to the manufacturing process, all foam products have some surface imperfections. These imperfections will not affect the performance of the products. Normal use will cause indentations or pressure points. Pressure points may slowly recover, however, continuous pressure lasting several hours should be avoided. Do not store objects on top of foam items. Best if stored flat and away from sunlight. Do not store next to sources of heat. Cleaning Use a mild soap and water mixture or Isopropyl (rubbing) alcohol. Do not use bleach solutions, oils or other chemicals as they can cause softening, discolouration and distortion of shape. 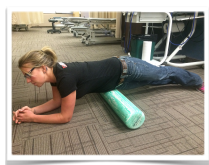 Note Use the foam roller in a safe clear area on a flat dry surface. Children must not play on the foam roller. Consult a physician before starting this or any exercise program.